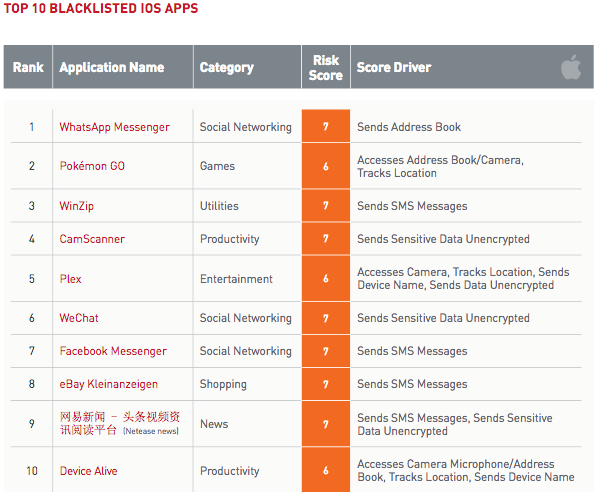 According to data collected by Appthority, iOS apps are typically blacklisted due to the fact that they leak data. The most commonly blacklisted iOS app is WhatsApp, which has a high risk rating due to the fact that it sends information from the device’s address book to a remote server. Another commonly blacklisted iOS app is Pokemon GO, which accesses a device’s address book and camera, and tracks the user’s location. WinZip is also banned by many organizations due to the fact that it sends SMS messages. This type of behavior can pose a serious risk in an enterprise environment, especially if the data is transmitted without being encrypted. 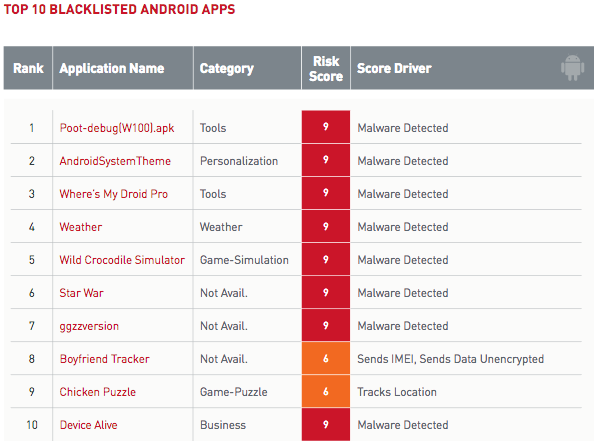 A majority of the top blacklisted iOS apps are in the social networking and entertainment category, as opposed to Android where many of the blacklisted applications are tools. The most frequently blacklisted Android app is Poot, a tool that allows users to root their devices. Other commonly banned programs are AndroidSystemTheme, Where’s My Droid Pro, Weather, and Wild Crocodile Simulator. While some Android apps have been blacklisted for tracking the user’s location or sending data unencrypted, in most cases the problem is that they exhibit malicious behavior. An analysis of the top 150 mobile apps found in enterprise environments showed that in the case of Android applications, 86.7% of connections are to a server located in the United States, followed by Ireland (7.7%), Germany (2.1%) and Sweden (0.7%). In the case of iOS apps, nearly 94% of connections go to servers in the United States, followed by Ireland (3.82%), the Netherlands (0.86%) and Germany (0.86%). Appthority’s report also lists the top 100 Android and iOS applications used in enterprises, along with their risk score, which can help organizations assess the risks associated with apps commonly used by their employees. Read the original article in Security Week here.